In the Dominican Republic “in February 1963, Juan Bosch took office as the first democratically elected president” of that country “since 1924;” and “he called for land reform; low-rent housing; modest nationalization of business; foreign investment provided it was not excessively exploitative of the country and other policies,” according to William Blum’s 2000 book, Rogue State. But “a number of American officials and congressmen expressed their discomfort with Bosch’s plans, as well as his stance of independence from the United States,” according to the same book. 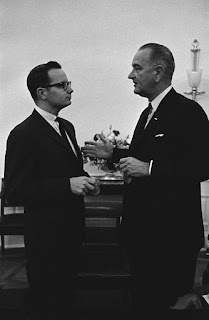 Johnson administration officials then “personally groomed Joaquin Balaguer,” who had been a close advisor to long-time Dominican dictator Trujillo prior to the CIA-backed assassination of Trujillo in 1961, “to head the Dominican government in 1966” and “U.S. aid insured Balaguer's control over the country,” according to a 1978 NACLA article by Philip E. Wheaton about the fraudulent 1978 Dominican Republic elections, that NACLA reposted on its website on Sept. 25, 2007. Although large numbers of people from the Dominican Republic now live in New York City area from which the parallel left Democracy Now! radio and cable tv show originates, since 2004 Democracy Now! has provided its listeners with neither very many news segments examining the role that the Democratic Johnson White House played in Dominican Republic history in 1965 nor weekly updates on the 21st-century political and economic situation within the Dominican Republic. One reason might be because the Schumann Center for Media and Democracy foundation has given the Democracy Now! media firm over $1.5 million in grants since 2004; and the long-time president of the Schumann Center for Media and Democracy foundation, Bill Moyers, was one of the Johnson White House officials responsible for the decision to order U.S. troops to invade and occupy the Dominican Republic in late April 1965, in violation of the United Nations Charter. In 2004, for example, Moyers’ foundation gave a $25,000 [equal to over $33,000 in 2018] grant to Democracy Now! “to fund Special 2004 election coverage for Democracy Now!,” according to the Schumann Center for Media and Democracy foundation’s 2004 Form 990 financial filing. And the 2009 Form 990 financial filing for the same foundation indicates that Moyers’ foundation gave a $300,000 [equal to over $350,000 in 2018] grant to Democracy Now! Productions in 2009. A grant of $750,000 [equal to over $810,000 in 2018] was next given to Democracy Now! Productions by former Johnson White House Special Presidential Assistant Moyers’ Schumann Center for Media and Democracy foundation in 2013, according to this foundation’s Form 990 financial filing for 2013; and, the following year, Moyers’ foundation gave an additional grant of $292,600 to help fund the parallel left Democracy Now! show according to the Schumann Center for Media and Democracy foundation’s Form 990 financial filing for 2014. In addition, another grant of $214,074 was given by Moyers’ Schumann Center for Media and Democracy foundation to Democracy Now! Productions, according to the foundation’s Form 990 financial filing for 2015; and between January 1, 2016 and December 31, 2016 yet another grant of $250,000, was given to help fund Democracy Now! by Moyers’ foundation, according to the 2016 Form 990 financial filing of the Schumann Center for Media and Democracy foundation. Yet according to Democratic President Lyndon Johnson’s daily diary, on Apr. 28, 1965—the day on which U.S. troops had been ordered by LBJ to begin occupying Dominican Republic territory—Johnson was in the lounge of the White House Oval office from 4:45 p.m. to 6:21 p.m. meeting with then-Secretary of State Dean Rusk, then-Defense Secretary Robert McNamara, then-Assistant Secretary of State George Ball, then-National Security Advisor and future long-time Ford Foundation President McGeorge Bundy and then-LBJ Special Presidential Assistant and future long-time Schumann Center for Media and Democracy President and Democracy Now! 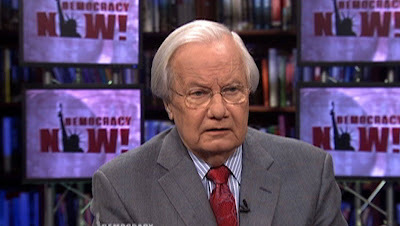 funder Bill Moyers. And during this White House meeting a conference call took place, in which Democracy Now! funder Moyers participated, that began at 5:45 p.m., in which “the President said we were not going to announce anything until they have landed” and “the President said that…he would say help was needed to protect the lives of the Americans,” according to a now-declassified Johnson White House document, titled “Memorandum of Telephone Conversation 4/28/1965 5:45 p.m.”. 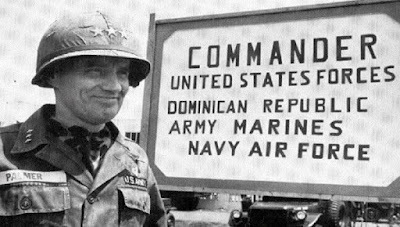 “Suddenly, the United States invaded the Dominican Republic in a massive, overwhelming way, under the pretext of defeating a Communist insurgency. It was quite obvious to me that the pretext was 99% baloney… But when you look at the Dominican Republic and you look at the Caribbean—more so in that period than now—you see that sugar was the dominant force. “So I started doing some research on who influenced sugar policy in the United States. What was the ‘sugar power elite’? And who pops up but Ellsworth Bunker. Bunker was Lyndon Johnson’s Ambassador to the Organization of American States (OAS) and special envoy to the Dominican Republic. He was the former president and a large shareholder of National Sugar Refining Corporation, the second largest sugar company in the United States. Right off the bat, this was interesting. Then there was Abe Fortas, Special Counsel to the President: board member of the Sucrest Corporation, very big in Puerto Rico, a large molasses importer. Then there was Averell Harriman, on the Board of Directors and with strong financial ties to the National Sugar Refining Corporation.